In case you hadn't heard, legendary broadcaster Vin Scully just announced he'll be back in the booth next year to call his 66th Dodgers season. So it seemed like there was no better way to pay tribute to the voice of Los Doyers than by dropping some almost-impossible-to-believe Scully factlets. A native New Yorker, Scully grew up ice skating and has boasted in the past that he “could skate”. In the early 1950s, while announcing for the Brooklyn Dodgers, he invited Jackie Robinson to join him for an evening skate on a rink in the Catskills. Jackie, having never skated before, challenged Vin to a race... which he probably lost, because again, Vin "COULD SKATE". 3. 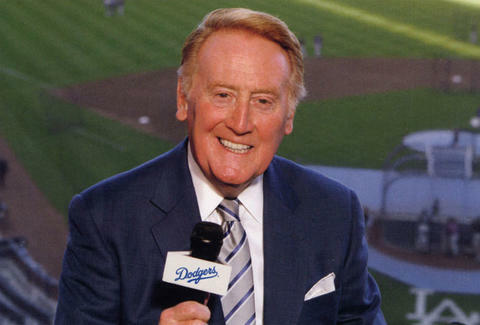 ​Vin once asked Dodgers fans, live on a broadcast, "What’s a hashtag?" 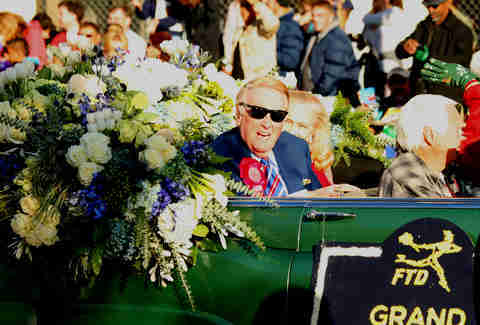 Vin was given a Championship Ring for each of the team’s five World Series championships in LA, but didn't received one for the franchise’s World Series victory with Brooklyn in 1955, because only “uniformed personnel” got those. Decades later, Tommy Lasorda’s wife, Jo, met a man at church who had worked for the ring manufacturer and was still in possession of the mold for the ’55 ring. Upon hearing this news, the team’s owner at the time, Peter O’Malley, paid to have two new rings made: one for Tommy, and one for Vin. Scully does interviews and reads extensively (especially Redbook), clipping out stories about players throughout the years and jotting down notes on index cards. He also keeps a media guide for each team, a yellow highlighter, and his trusty, leather-bound scorebook handy -- an old-school, custom-made tool of the trade he's used for more than four decades. Still a student at Fordham University, Vin got his break after impressing legendary Brooklyn Dodgers announcer Red Barber, then the Sports Director of the CBS Radio Network, while doing play-by-play for a college football game at Fenway Park in November of 1949. With no room for him in the press box, Scully had to call the game while sitting at a card table on the roof in the frigid cold. 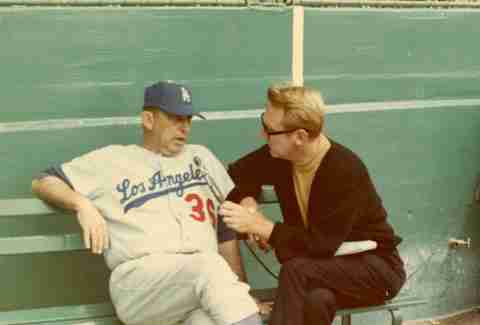 Despite not having his coat or gloves with him, Vin never mentioned the conditions during the broadcast. Boss. 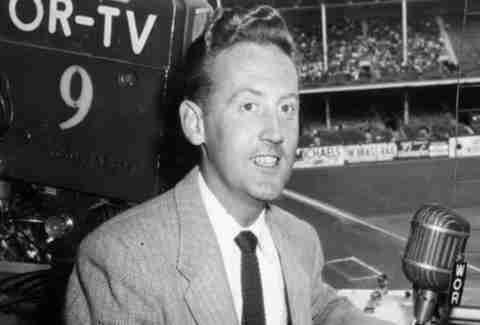 Red Barber bowed out of the 1953 World Series due to a salary dispute with sponsor Gillette, and the then-25-year-old Scully became the youngest broadcaster ever to do a World Series game (a record that holds to this day). Before calling his first World Series game, he was so nervous that he threw up. While on the air, he questioned an umpire’s call, and on the drive home felt so badly about it, he nearly threw up again... but instead probably just did one of those burps where your mouth sort of tastes like vomit. While he's known for his iconic baseball calls (Kirk Gibson’s dramatic homer in the '88 World Series, Bill Buckner's infamous error which led to the Mets winning the '86 World Series, Sandy Koufax's four no-hitters, and Henry Aaron’s 715th home run), few know that he also made the call on what may be the most famous football moment in NFL postseason history: Dwight Clark's touchdown catch in the NFC Championship Game on January 10th 1982, made in his final NFL telecast for CBS. Scully played centerfield for the Fordham University Rams baseball team, and was the leadoff hitter for a game in 1947 against Yale and then-first baseman (and future US President) George H.W. Bush. It Takes Two ran from 1969-70, wherein three celebrity couples competed by answering a series of questions. 11. Vin’s dream job if he wasn’t already working his dream job? A song & dance man (if that were still a thing). A member of a barbershop quartet in college, he once sang "Take Me Out to the Ball Game" at Wrigley Field and danced on a Dodgers promotional video. 12. The most famous and beloved Dodgers figure of all time's two favorite players are... Giants? Proving nobody's perfect (he was so close! ), Scully has -- on multiple occasions -- said the best player he ever saw was Willie Mays (a New York and San Francisco Giant), and his favorite player growing up was Mel Ott -- also a New York Giant. Vin has always prided himself on being friendly with the umpires. At one game, Crew Chief Bruce Froemming and his fellow umpires turned and doffed their caps to him in the broadcast booth. 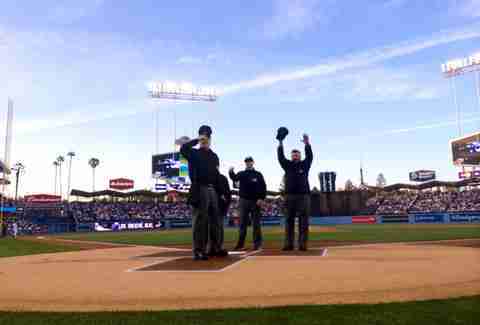 The moment was captured by Dodgers photographer Jon SooHoo, and ever since, umpire crews acknowledge Vin at the beginning of every series. In 1982, the Dodgers honored Scully by naming a street running through their once-famous Spring Training residence -- Dodgertown in Vero Beach, FL -- after him. The very modest Scully has, however, declined requests to name a street near Dodger Stadium after him. Stanley Brooks is an Emmy-winning producer and director of the feature film "Perfect Sisters", as well as the founder of The Hollywood Indies Little League, a non-profit dedicated to bringing little league baseball to South Los Angeles; he's also been a Dodgers season ticket holder since 1964.